Parisians are losing something very important to them as Notre Dame Cathedral burns, says Alan Nobili, who grew up about three kilometres from the medieval cathedral. “This is simply unbelievable. 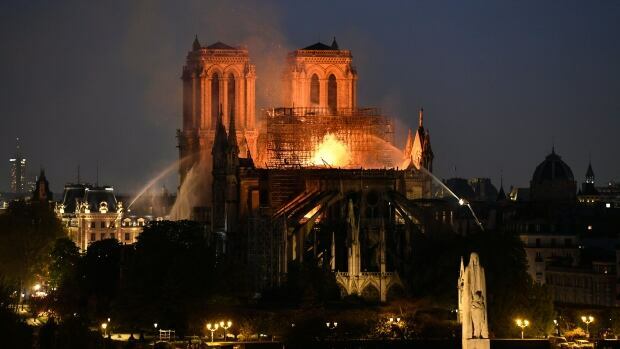 This is very sad for Paris because this monument is incredibly important for us,” Nobili, executive director of the Alliance Française du Manitoba, said Monday as the 850-year-old landmark burned. The fire started Monday evening (which is seven hours ahead of Winnipeg) and within hours the cathedral’s iconic spire had collapsed and the roof had fallen into the wooden interior, throwing flames, smoke and ash into the evening Paris sky. “I am very sad and I think most of my fellow friends and fellow French people are very sad today,” Nobili said in Winnipeg on Monday afternoon. He last visited Notre Dame last year, he said. “We are losing … something which is very important to us,” he said, adding the cathedral, which he first visited with his school as a child, is among the most-visited monuments in Europe and the world.